We're heading back to Empire Control Room on October 24 for our first community meet-up of the fall. This month, we're featuring multimedia artist DJ Mahealani (see more of the siren series on her Instagram), highlighting a handful of local lady vendors and as always, we've got 30 announcements from self-identifying women in Austin, sharing stories about their creative, entrepreneurial, professional and political pursuits. Come out to mingle, meet new people and learn about the Austin community. Pieceology Vintage is a curated shop of vintage clothing and accessories sourced mostly in Italy, but also from all over the world. You will find whimsy, boho frocks from the Cinque Terre to western wear found right here in their home-base of Austin, Texas. SubtleTee is an outlet for our outrage and their mission is to influence positive change, by way of comfortable and versatile apparel each with a subtle (and relevant) message. We strive to help the many Americans that are concerned about todayâ€™s political climate speak their voice through their wardrobe while supporting socially minded non-profits. Clove + Couple offers handmade macrame and vintage up-cycled home decor, right in the heart of Austin, Texas. Morgan currently works as a visual designer for IBM and regularly freelances. Past clients include Red Hat, Texas A&M University Kingsville, Texas State University, Shiny Object, The College Board, and ARTtv. She also often makes, vends, and shows her illustration work in public spaces. As a tarot reader, La Mystica offers readings, workshops and altar and ritual creation. She believes tarot cards serve as a potent tool for self-inquiry and aims to help the seeker clarify feelings, needs and desires of the present moment, in order to make empowering changes that align with the future they seek. Art is Cool is a multi service art and media production company specializing in photography, videography, documentary films. They also produce live art shows as a way to provide exposure for emerging artists and spaces for community events. DJ Mahealani spins vinyl and works as a multimedia artist. In September and October 2017, #bossbabesATX is highlighting Mahealani's Siren series, a collage series portraying 100 women musician icons as mermaids. From 6:30 to 7:30 PM, we'll play Babe Bingo, one of our favorite icebreakers. 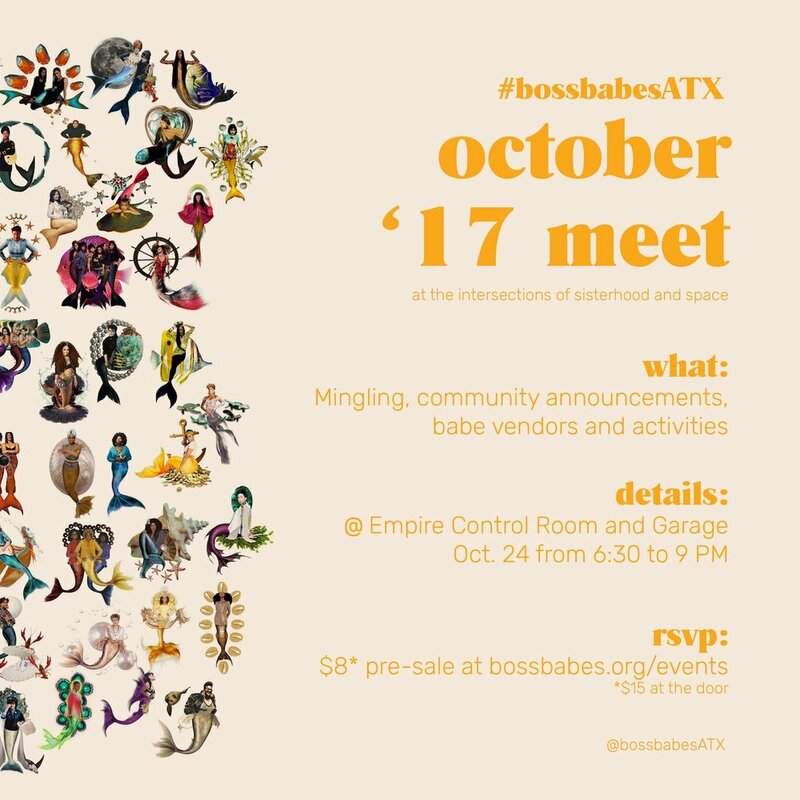 First to fill out their bingo card wins a #bossbabesATX tee. At the #bossbabesATX table, we'll gather answers to this meet's topic question to then later share on our blog. This month's topic Q is What is your resistance? Founded by Riley Blanks, Woke Beauty is a portrait series empowering women to recognize and appreciate their own inherent beauty-through the art of photography. *All proceeds cover our operational costs and event production costs. Pre-sale is no longer available and tickets are $15 at the door. This production has been made possible in part by the LINE ATX.